Hans Wegner helped foster the popularity of Danish design and its signature functional-yet-warm modernism. Along the way, he designed hundreds of chairs, many of which went into mass-production. See just a few in these contemporary residences. Anne Sophie Goneau designed a sleek renovation for an apartment built in 1887. 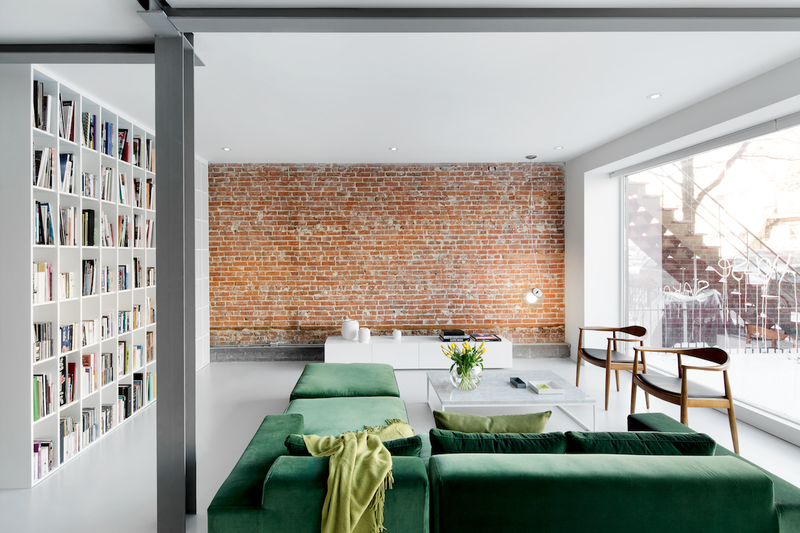 She highlighted the red brick wall in the living room by leaving it bare and protecting it behind museum-quality glass. The space also features a floor-to-ceiling window that’s coated on the outside with a reflective film, letting residents keep their curtains open by day without fear of being seen from the street. The green sofa is by St-Laurent Domison and the white oak chairs are by Hans Wegner. All other furniture is custom. Two designers restored a low-slung midcentury gem in Napa, California, by an unsung Bay Area modernist. In the bedroom, a Margaret Kilgallen print joins a Brionvega Algol television, lamps from Patricia Urquiola and Pablo, and a Hans Wegner chair. Restrained by local building code, architect Michael O’Sullivan forwent a flashy facade on this new Auckland, New Zealand, home, saving the fireworks for the interior. Adjacent to the main living area sits a snug lounge that looks out through mullioned windows onto a swimming pool. The room features a CH25 easy chair and a CH008 coffee table, both by Hans J. Wegner for Carl Hansen & Son, and a Mags modular sofa by Hay Studios, all of which are from Auckland’s Corporate Culture and were chosen by Jay and resident Jes Wood. The vase is by New Zealand potters Bruce and Estelle Martin, and the carpet (in Citrine) is from the Lees’ Truth in Color range. Tired of waiting for innovative architecture to come to San Diego, this proactive architect added developer to his job description, and brought it there himself. In the humidor-like living room, modern classics like the off-white armchairs by Hans Wegner complement pieces of Segal’s own design, such as the coffee table and long leather seating. With a confident color palette and clever space-saving tricks, designer Peter Fehrentz transformed a 646-square-foot apartment in Berlin. The old wood floors throughout the open-plan space are painted a dark eggplant. The vintage PP19 armchair is by Hans J. Wegner for PP Møbler. The painting above it is by Ruben Toledo, a friend of Peter Fehrentz, the resident. A trio of Tom Dixon lights hangs over the Pirkka dining table, with bench seating by Ilmari Tapiovaara for Artek. The Berber rug is from Morocco, purchased from the Paris shop Caravane. This modern house steeped in heritage, history, and spirituality emerged on the fringes of Scotland’s Isle of Skye. In the dining room, Hans Wegner Wishbone chairs surround a custom table by Mary Arnold-Forster. The pendant lamps are by Bestlite. An intervention from a clever interior designer spared an old beach house on Fire Island, New York, from demolition. The architect transformed a beachside cabin into a colorful retreat for a college friend and her family. The living area features a PP130 Circle Chair by Hans Wegner and a Shaker wood stove by Antonio Citterio withToan Nguyen for Wittus. A Tropicalia Cocoon hanging chair by Patricia Urquiola complements the fabric from Liberty that Angle used for the cushions on the built-in banquette.